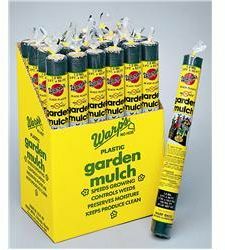 Economical black plastic mulch is specially formulated to block light, stop weeds. In spring, black mulch absorbs the sun's warmth and transfers it to the earth. It holds moisture through the heat of the summer. Choose low cost, longer lasting Warp's plastic mulch for your landscaping, flower or food gardening projects.